I belonged to a watercolor group and once a month we would have a challenge. 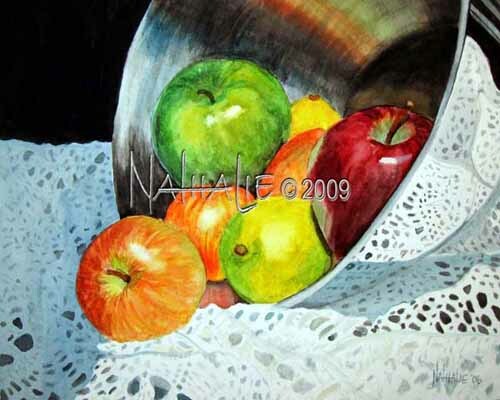 Artist Lori Andrews submitted a great photo with apples, a chrome bowl, and vintage crochet as our challenge. I couldn’t wait to get started. I did not mask the white areas of the crochet but painted in the shades blue and grey. I was so anxious to capture this image that I carried my watercolor paper, paints, and brushes with me and I would paint in my car during my lunch hour. The whole image was a wonderful challenge to create.